It has been a little over two years since a determined lawyer took it upon himself to start cleaning a heavily polluted stretch of beach in India. His efforts have led to the coastline’s transformation from a trash-ridden landfill into a sparkling sandy sanctuary. Not only that, but it has become a hatchery for a vulnerable turtles species that has not been seen on the beach in decades. The transformation of Versova Beach, which was first initiated by Afroz Shah, has been called the world’s largest beach cleanup project by the United Nations. Though the cleanup eventually recruited thousands of volunteers, Shah was the first one to start cleaning up the shin-deep piles of trash. While Shah has taken great pleasure in witnessing the beach’s radical change, the fruits of his labor came to a tee earlier this week when 80 Olive Ridley turtles hatched on the southern end of the 2-mile beach. 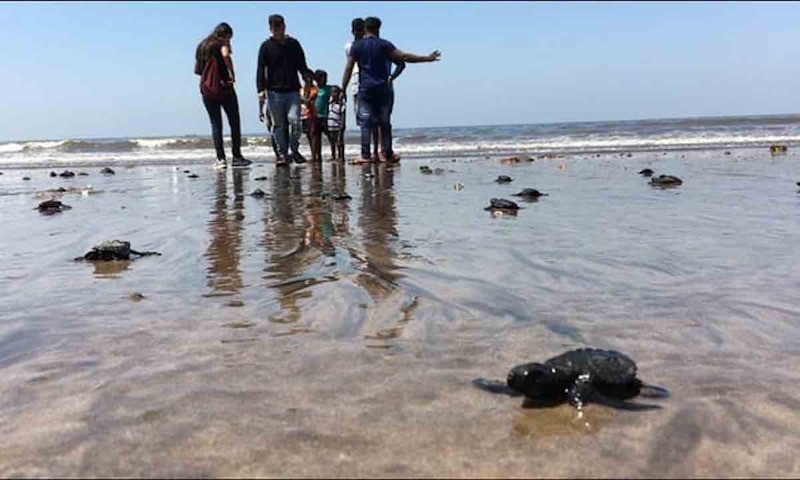 The turtle species, which is listed as “vulnerable” by the International Union for the Conservation of Nature, has not been spotted on Versova Beach in decades. In order to ensure their safety, a team of volunteers slept on the sand so they could watch over the turtle nests and protect them from predators. “I had tears in my eyes when I saw them walking towards the ocean,” said Shah.